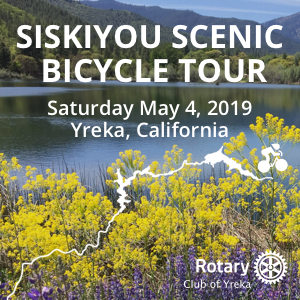 Ride through beautiful Siskiyou County, CA- just south of Ashland. Rides of 81, 69, 38, 21 and 8 miles. Elevation gain of 4,592 down to 459 ft. Something for the entire family. Rides start and end at Upper Greenhorn Park in Yreka, CA. The longest ride goes around Irongate and Copco Lakes on the Klamath River. Spectacular scenery. Great post meal feast with entertainment by the Shasta Taiko Drummers. Visit us at www.siskiyoucentury.com for complete ride information, route info, maps and to register. The 2 longer rides start at 8am, the others at 10am. Camping available at the park. Multiple rest stops with food, and sag wagons for support.